My baby girl, my only child has completed her Pre-K year. I couldn’t be more proud of her. I know, I know, it’s a little silly when you think about being proud of completing pre-k, right? It’s not like she wrote research papers or received an associate degree while taking high school classes or worked a part-time job and maintained the A Honor Roll, or that she’s off to some Ivy League School. Like what did she really do that I should be so proud? Well, I’ll tell you what she did first and foremost. She blossomed! She blossomed and learned in so many different areas! That’s why I’m proud. Just look at those pictures! Just look at them. You might not be able to tell, but she grew an inch and gained 5 pounds too! The little buttercup went from being mostly shy and timid to outgoing and confident. Granted, she still gets a little nervous talking to people, but at least she’s not hiding behind my legs anymore. As much, anyway. That’s why I’m proud. Of course she learned lots of academic type of things. She can read several words and a few little books, she has great number sense, and a lot of common sense as well. She tries her best at everything she does and wants to succeed. She is responsible and superb! That’s why I’m proud. She also did big 5-year-old things this year, like learning to tie her shoes and fix her own hair, which might look a fright most of the time, but she does it herself and her independence and self-confidence is more important in the big scheme of things than a perfect hair-do. She also decided that she can put herself to bed and sleep alone. But every 4th night, I can still sleep with her. She’s growing up independent and confident. That’s why I’m proud. She worked so hard in both her dance and gymnastics classes and more importantly had fun doing it. She can swing herself on the swings with just one push to get her started, and cross the monkey bars by herself. She is learning that hard work pays off and practice does make almost-perfect. She is learning that things may be hard at first, but not to give up, keep on trying and eventually you’ll get there. That’s why I’m proud. She is good and kind and thoughtful which is the most important aspects I would like her to develop in her years of learning. I want her to know that it is better to be a friend to someone who needs one, than to fit in with the “in-crowd”. I want her to know that not everything is going to come easy, but she’ll never be disappointed in herself for knowing she gave it her all. She learned more this year of the important stuff than she might learn her entire academic career. Her foundation is laid. These next 13 years are going to fly by. I know that all too well. It may be that some day she’ll be off to an Ivy League School, or maybe she’ll backpack across Europe. As long as she stays true to herself and discovers happiness in her journeys is my heart’s desire for her. It may seem silly to you that I write these milestones down, but I know my memories won’t always be as clear and I want to remember it all: every little accomplishment, every single stepping stone on her path to wherever she is heading. She is such a joy, and I am so very proud to call her mine. I’m a bit of a creature of habit. Just a bit. Not too much. Only when I want to be, really. But I do have a little tradition of blogging on certain celebratory occasions. My daughter’s b-day and Mother’s Day are the only 2 I really think of right now. Most of the time, this little blog is a ball of random. When the whim hits. Which hasn’t been hitting much lately. 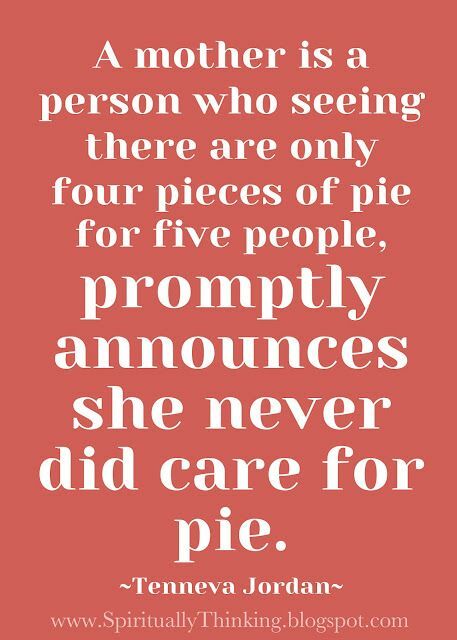 Motherhood is complete sacrifice, even when you adore pie. Motherhood is seeing the tiniest, most minuscule, grain-of-sand-sized love God has for us. Motherhood is a heart that is both broken and full to bursting often at the same time. Motherhood is an exhaustion beyond what you ever thought possible. Motherhood is sticky fingers and sweet kisses. Motherhood is a million “I love yous” and a few teenage “I hate yous”. Motherhood is lots of laughs and plenty of tears from all parties involved. Motherhood is eating lots of spaghetti. Motherhood is late nights and early mornings and feet in your ribs when sleep does come. Motherhood is thankless mostly, but worth every moment. This Mother’s Day I was showered with little gifts. Gifts that will be put away in the bin with the other sweet gifts I’ve been given and the ones hopefully to come. Each moment is a true gift. A treasure to hold. Time passes so quickly. For some, motherhood never happens or sadly ends too soon. My little daughter came into my life unexpectedly and the emotions I went through were paramount. We are tight. This girl and I. We have a bond right now that I hope will outlast all the growing pains we still have to endure. The past five years have flown by, and I know the next 13 will zip past. And then she’ll soar on the wings that her dad and I have hopefully helped give her. So for now, I cherish every Eskimo kiss, every hug, every stick figure drawing stuck to the fridge, and even every melt down. Every beautiful moment of motherhood for the past five years I have tried to store away, either in my memories or in this blog. I have been given such a remarkable little girl and I am so honored to be her mom.